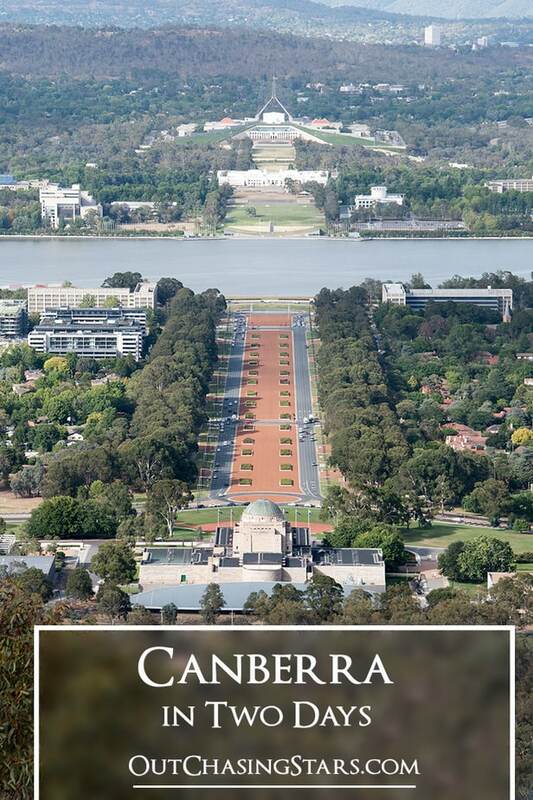 Our first stop in our 6 week Australia itinerary is Canberra. 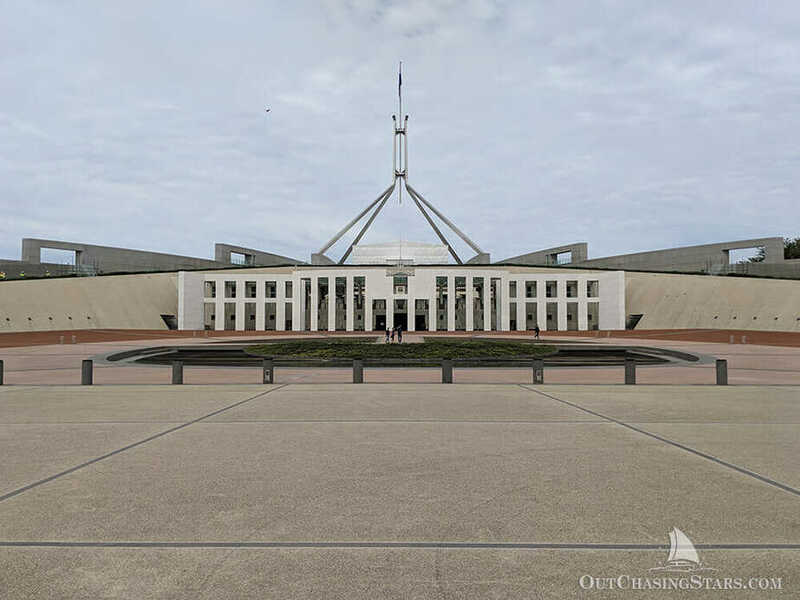 Aussies love to hate on Canberra, and it is a bit understandable why – it’s a city built from the ground up to house politicians. Politicians in Australia seem to get about as much love as they do in the US! When Australia federated, they needed a location for the capital. Melbourne was the biggest city at the time, but Sydney was rapidly growing and eventually surpassed Melbourne as the largest city in Australia. So, the powers that be chose a middle ground. Between the two powerhouses sat the tiny unsuspecting town of Canberra, full of sheep, Aboriginals, and a single general store. The capitol was designed from the start to be a city of politicians. Australia launched an international design competition, which was won by an American couple from Chicago, Walter Burley Griffin and Marion Mahony Griffin. Marion Mahony Griffin turns out to be a pretty impressive lady. She was one of the first licensed female architects in the world and worked with her husband and Frank Lloyd Wright. She was instrumental and often under-recognized for her contributions to the Prairie School of architecture. The city’s design is based on the Parliamentary Triangle, connecting the Parliament House, Defence Headquarters, and City Hill. The natural landscape creates a line through Red Hill and Mount Ainslie, with the water feature, a man-made lake, bisecting the line. The climate of Canberra is extremely arid, very apparent to us after weeks of the Gold Coast humidity. The city layout provides for wide open spaces throughout the city, so although it’s in Australia’s top 10 biggest cities, it’s very residential; there’s plenty of room and no skyscrapers to be seen! The first morning we woke up early and went to hike up Mount Ainslie to get a view of the city. Mount Ainslie is one of the points of the land axis in the cities design, and at 843 meters tall, provides a wonderful view of the city. 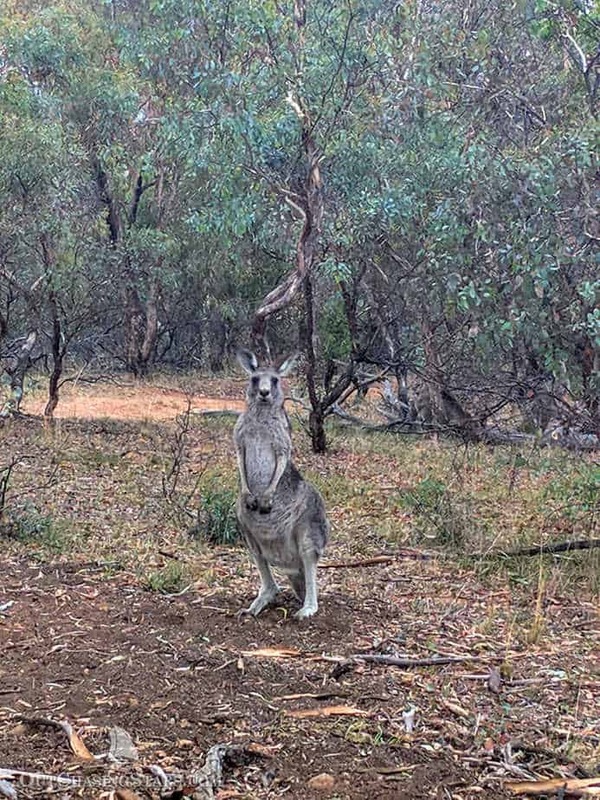 The mountain is in the Mount Ainslie Nature Reserve, which is also home to eastern grey kangaroos. We saw a cute little herd of them on our walk! Yes, we see you and you are very cute. The hike up is steep and takes about an hour. You can drive to the top, but it feels a lot better to earn the view! Looking across the city you can see Red Hill, and together, they form the natural line of the city. Below us aligned the War Memorial, Old Parliament House, and the current Parliament House. Looking down the axis in Canberra from Mount Ainslie. 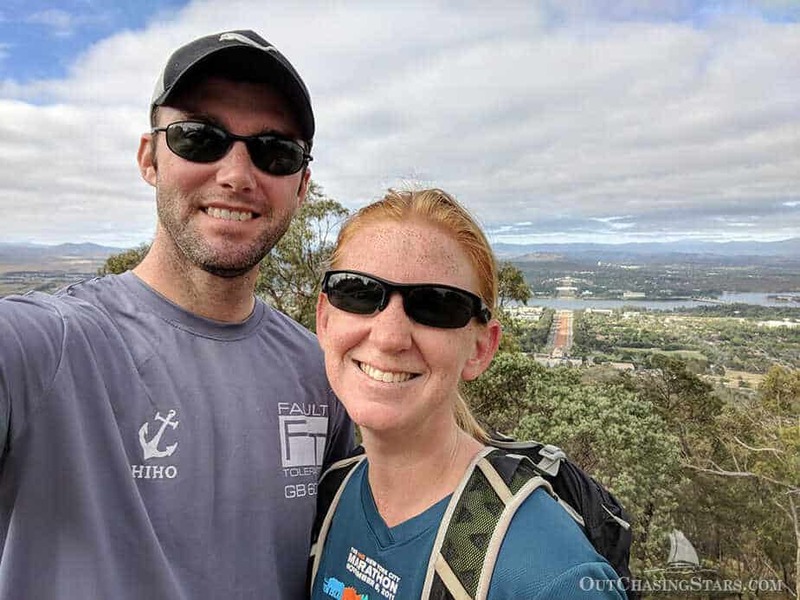 David and Amy at the top of Mount Ainslie in Canberra. Walking back down, we arrived just in time for the opening of the War Memorial. 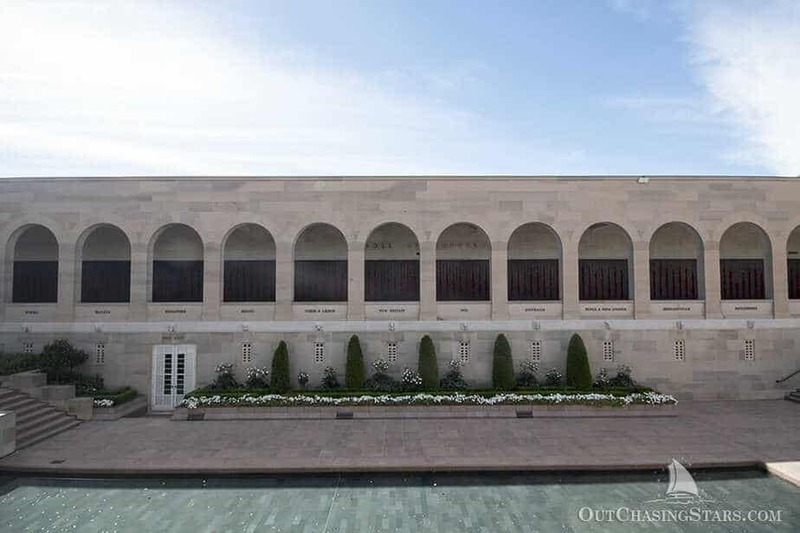 Not only is this a memorial shrine, but it houses a museum and archive research facility. We spent about an hour in the memorial shrine, reading the names of the fallen and on the half hour watching the changing of the guard. 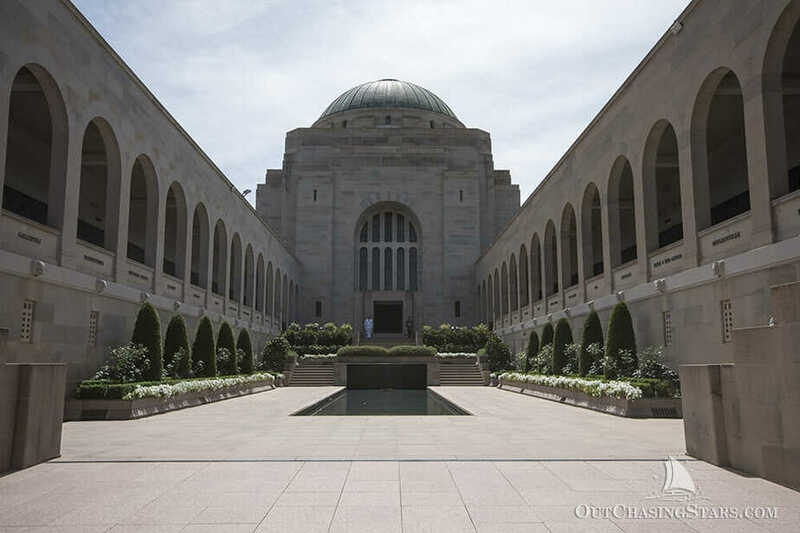 The Tomb of the Unknown Australian Soldier is a beautiful and peaceful space. 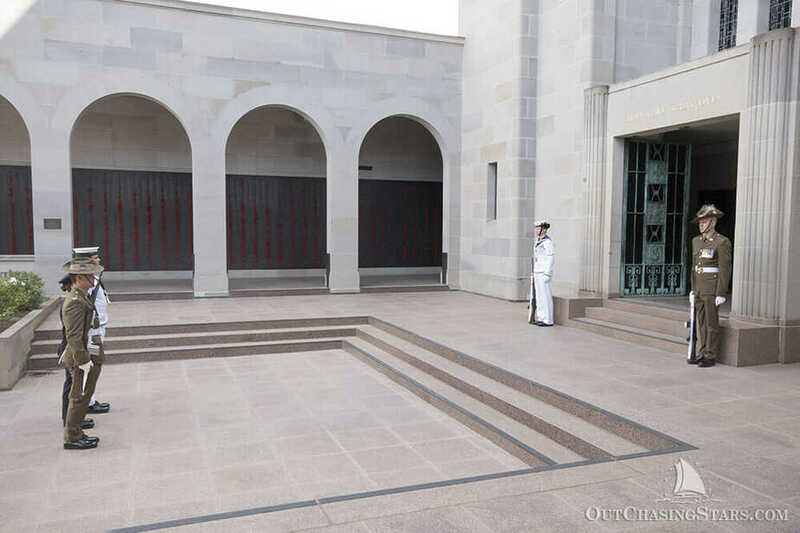 The courtyard at Canberra’s War Memorial. 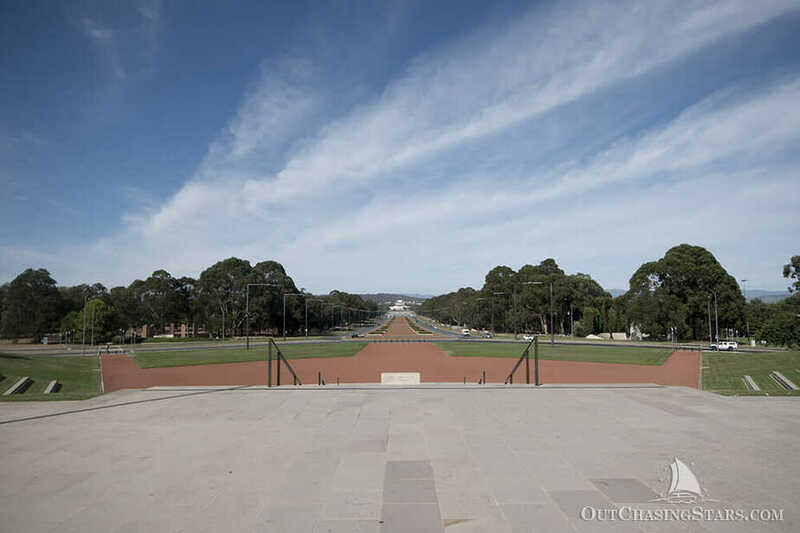 The view of Canberra from the War Memorial. 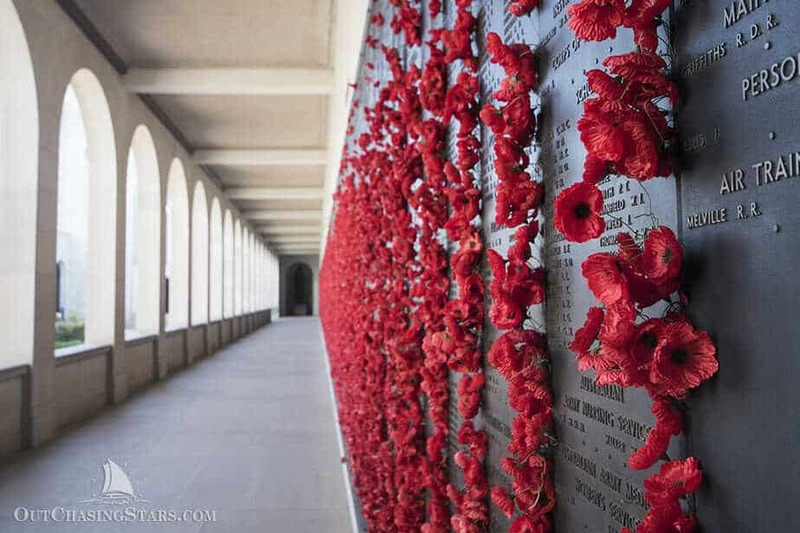 The Canberra War Memorial’s Roll of Honour. Remembrance poppies for the fallen soldiers. 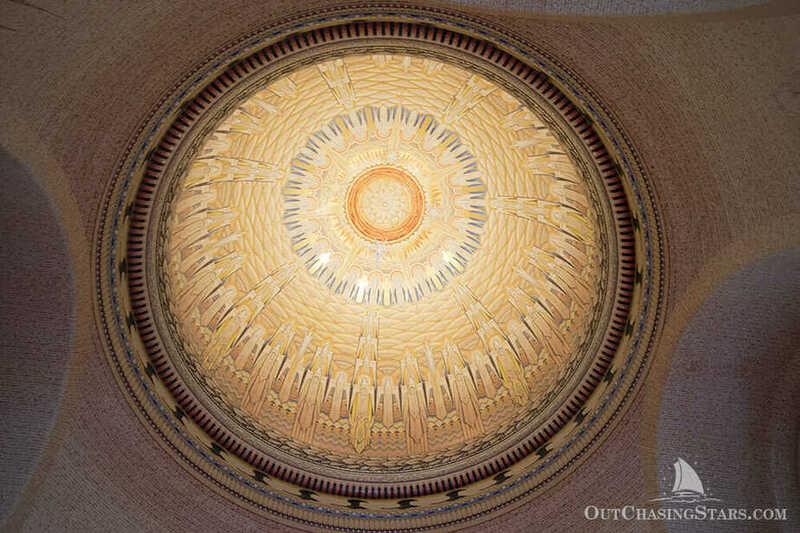 The dome and tiny oculus of the Tob of the Unknown Australian Soldier. Changing of the guard at the Tomb of the Unknown Australian Soldier. 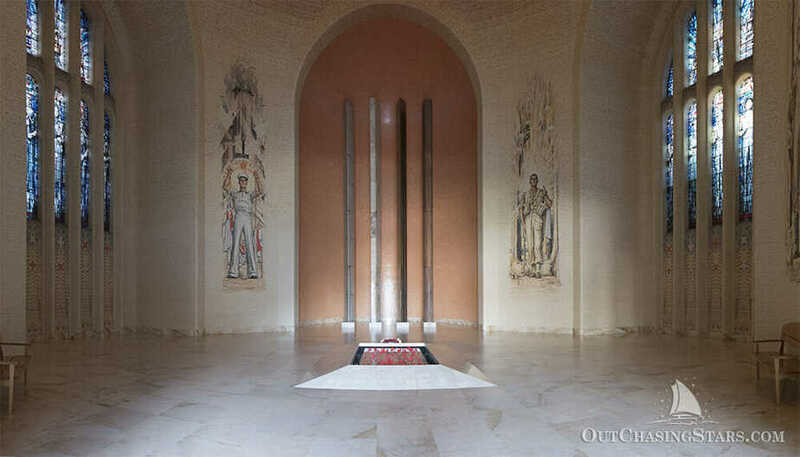 The Tomb of the Unknown Australian Soldier. Unlike many war museums we’ve been to, the museum doesn’t just cover WWI or WWII. 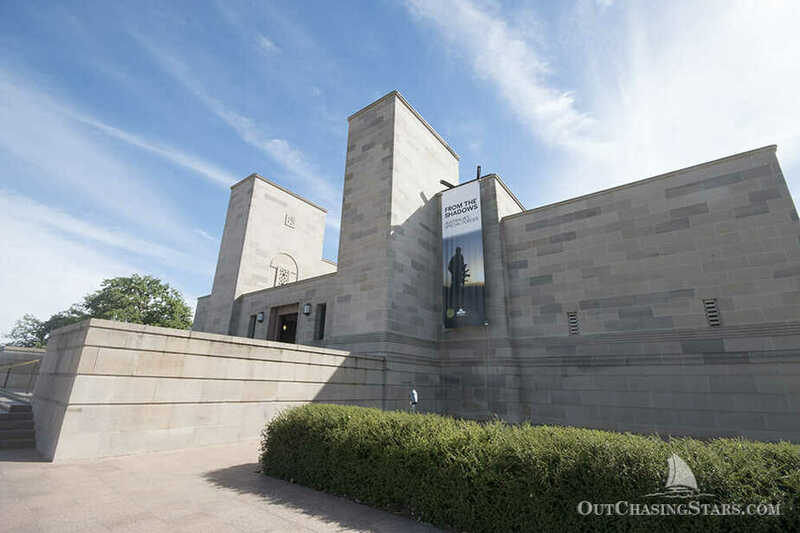 There are also exhibits on more recent wars, and a special exhibit was on called Out of the Shadows about Australia’s Special Forces teams. The museum is very well done, and houses artifacts, dioramas, and interactive displays. For day two, we got a special treat in Canberra! 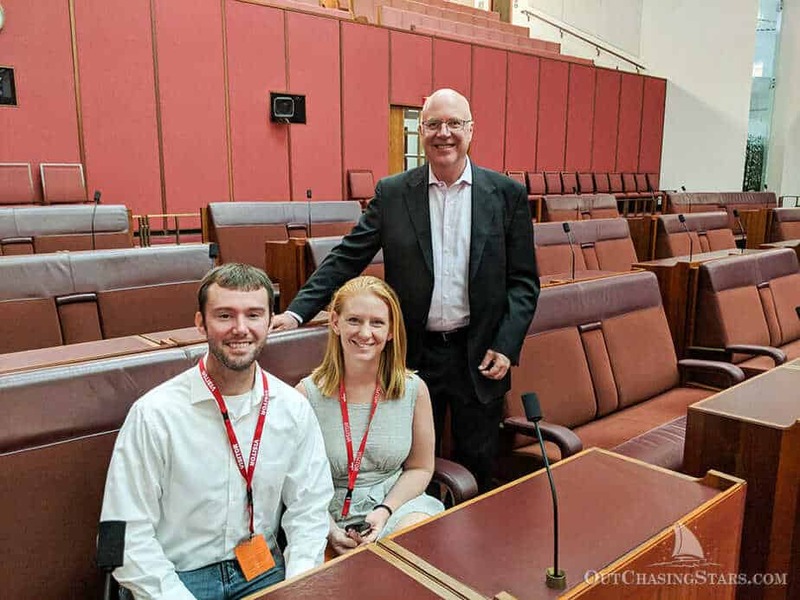 Senator Marshall contacted us in advance and said he watches our videos….would we like to come for a tour of Parliament? Of course! We joined Senator Marshall for lunch in the staff & members cafeteria, and then had a private tour of the building. Neither branch was in session, so it was very quiet in the halls. We were able to go into both the Senate and the House, see the library and the Great Hall. 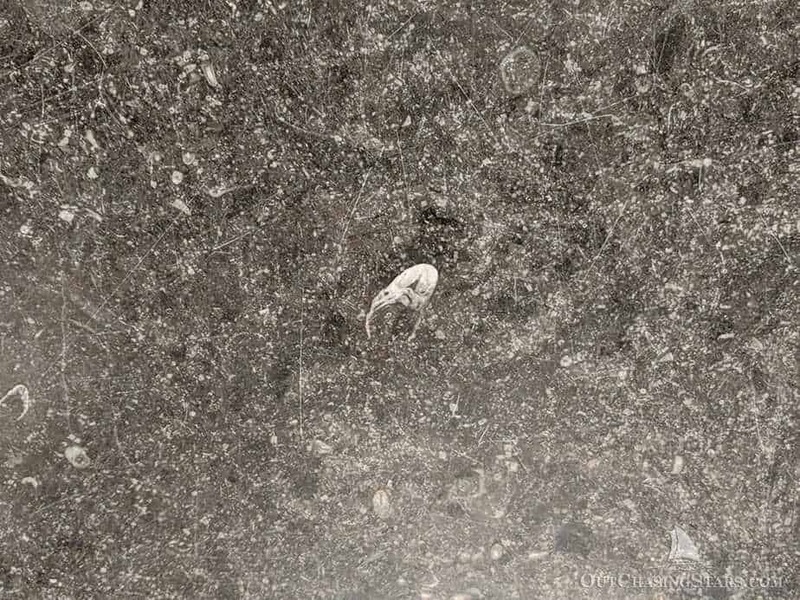 Our favorite tip from the tour was about Shawn the Prawn, a fossil in the black granite of the main foyer that has received the adorable name. 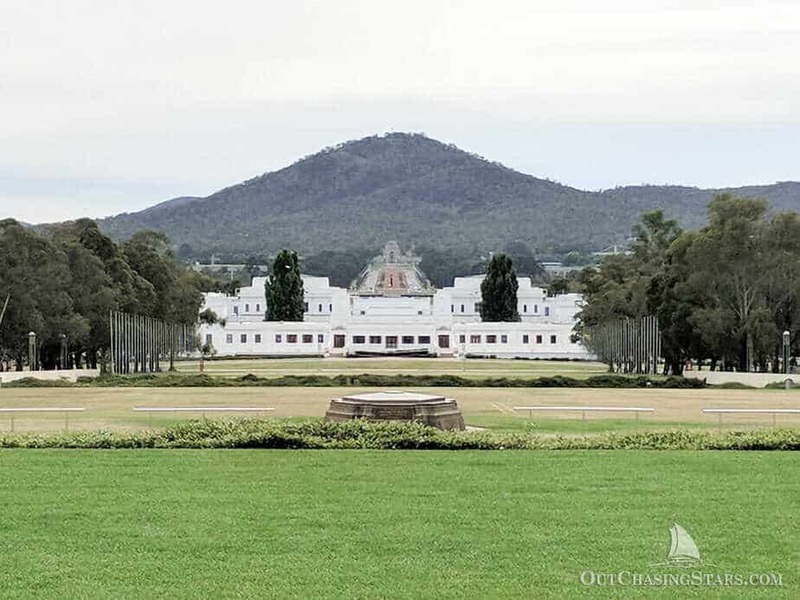 Looking from Parliament House back towards Mount Ainslie, with the Old Parliament House and the War Memorial in between. 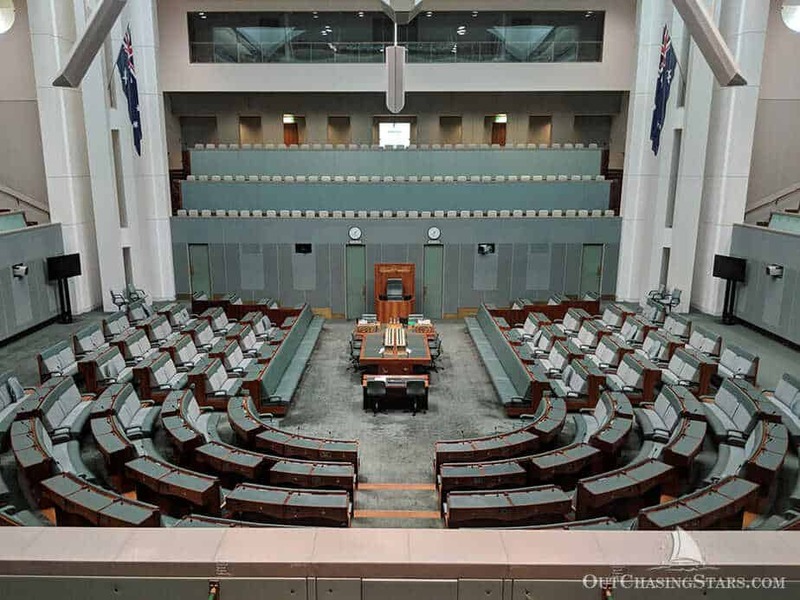 Australia’s Parliament House in Canberra. Amy and David outside the Parliament House. Shawn the Prawn at the Parliament House floor in Canberra. After the hour long tour, Senator Marshall had the Senate opened for us, so we got to see everything up close and personal and even sit in his chair! He also took us to his office. It was such a unique experience, and so cool to have an “in”. You don’t have to have an “in” to do most of what we did though – 40-minute tours are available to the public for free. Thank you very much Senator Marshall! We stayed in this lovely AirBNB in the Ainslie area of town. We hardly saw our hosts (good or bad thing?). 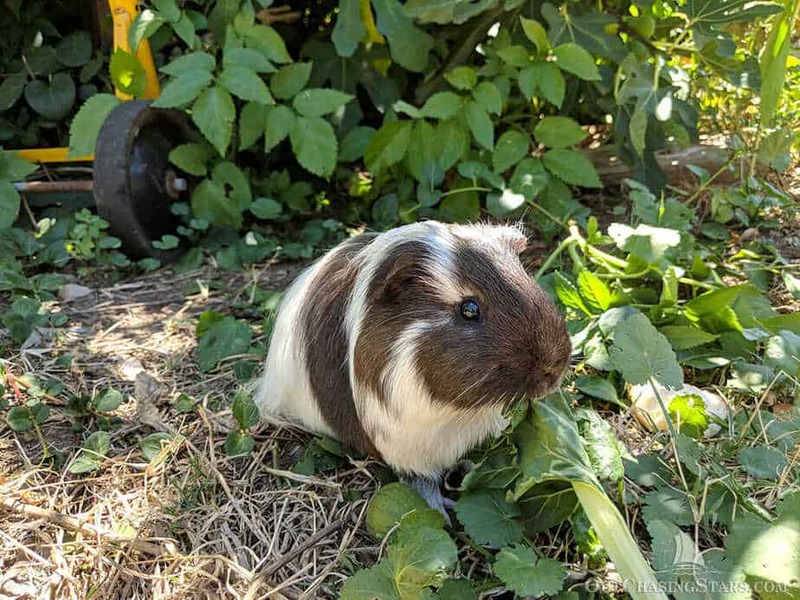 The backyard has an adorable guinea pig who roams free and raised bed gardens. The space we stayed in was a wing of the house, with a blocked off door to the rest of the house but our own private entrance. Ainslie is walking distance to Lonsdale St, chock full of eateries. His name is Romeo and he ate figs from my hand! When we booked our trip, we reached out to fellow cruisers that we met way back when we first arrived in Tonga in 2016. 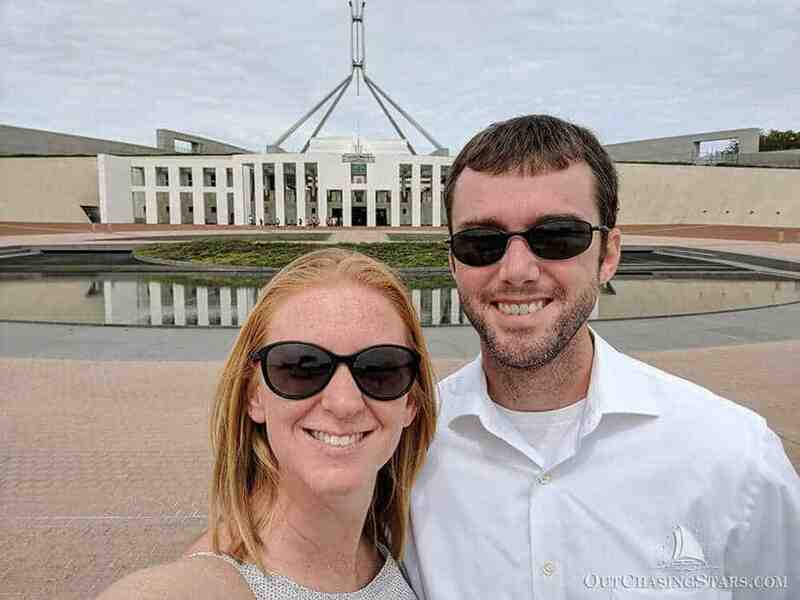 Tracey and Scott have settled into work in Canberra, while their boat, SY Yollata, is in New Zealand. They were incredibly helpful with advice, rides, and we all went out to dinner. Great to catch up with them. Great catching up with fellow cruisers on SY Yollata. We also had a meetup in Canberra. We had eight people attend, and enjoyed meeting and chatting with some of our subscribers. 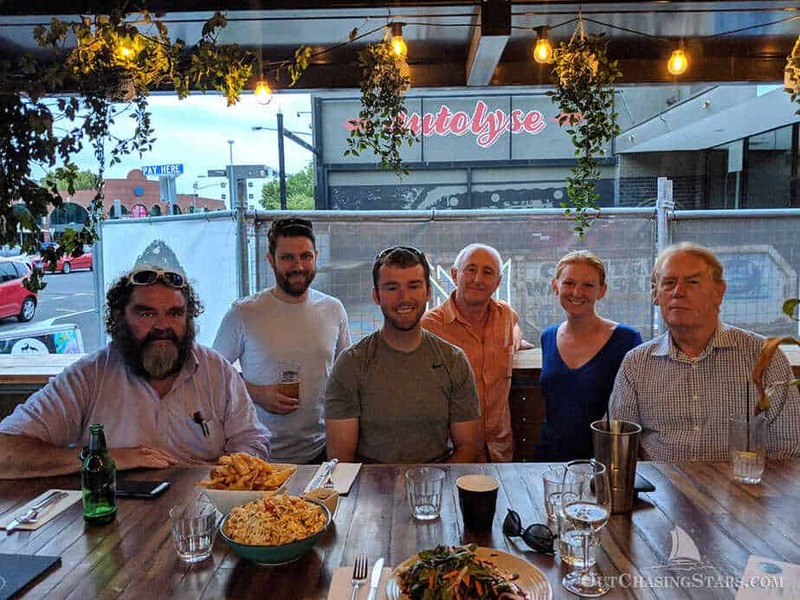 Our Canberra meetup! Pretty good turnout for a landlocked city. (Not pictured, Helene and baby Monty, as it was past his bedtime). 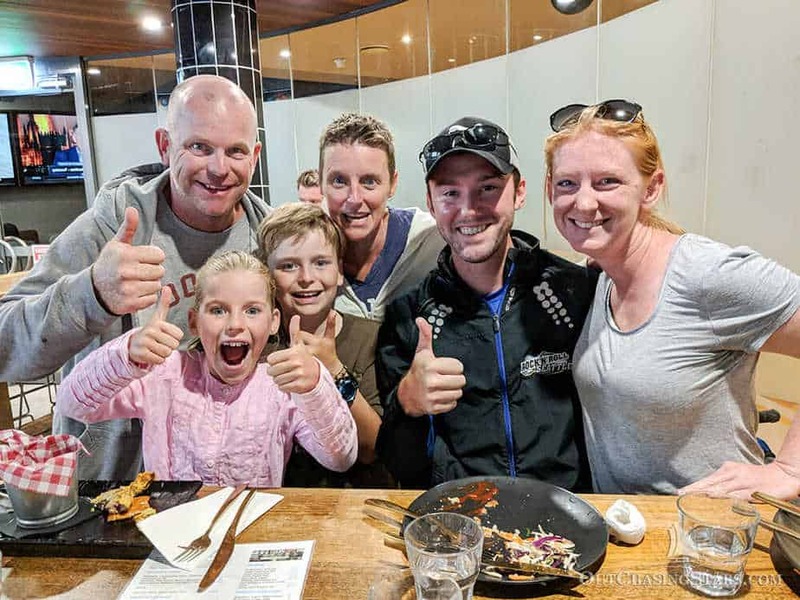 Lonsdale seems to be THE place for food in Canberra. We ate at three noteworthy places; delicious pulled pork burger at Grease Monkey, tender dark meat roasted jerk chicken at The Elk & Pea, and Afghani food at Bamiyan. We’d never had Afghani before, and it was fun to try unique dishes. My favorites were the dumplings and the bolani (basically an Afghani quesadilla). 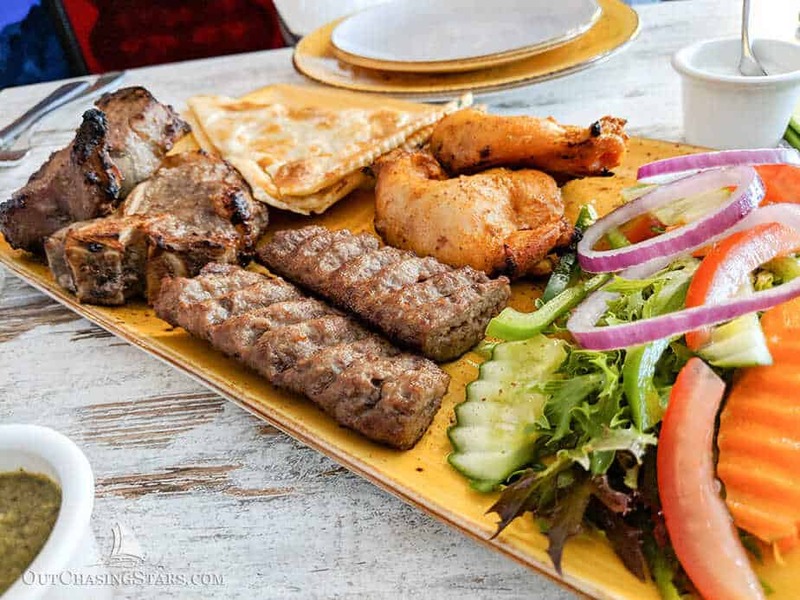 A sampler lunch of Afghani food. 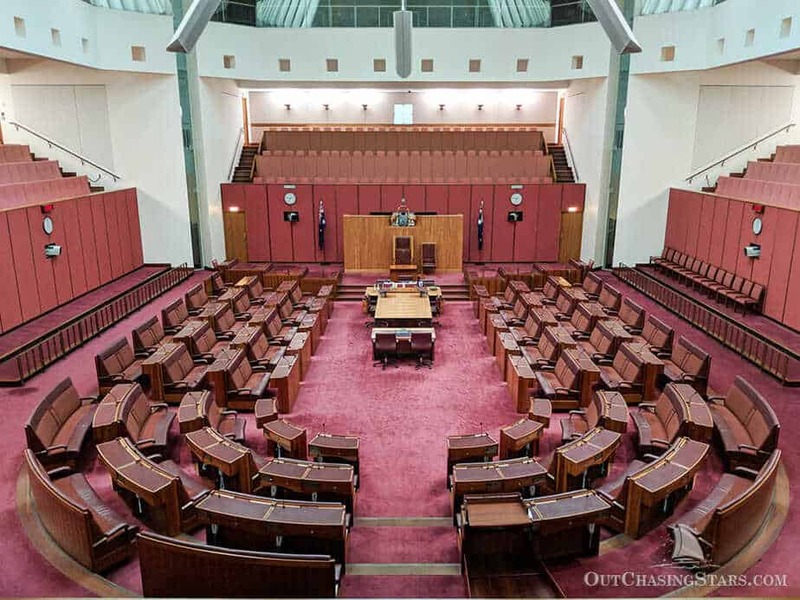 One could easily spend more than two days in Canberra, but it’s a big country to see. We flew out to our next stop; Adelaide! What a great blog! Have to try to up my game! Well done. Inspired me to visit Canberra! I haven’t been to Australia, just a short stopover in Gold Coast, but would love to discover it. And it’s good that you mentioned about Melbourne and Sydney as there are so many people thinking that one of these two is the capital city 🙂 Canberra is overlooked. But it seems like you had a nice time, I bet it was great being invited by a senator 🙂 Enjoy your travels! Thanks Andra, it was a great trip. 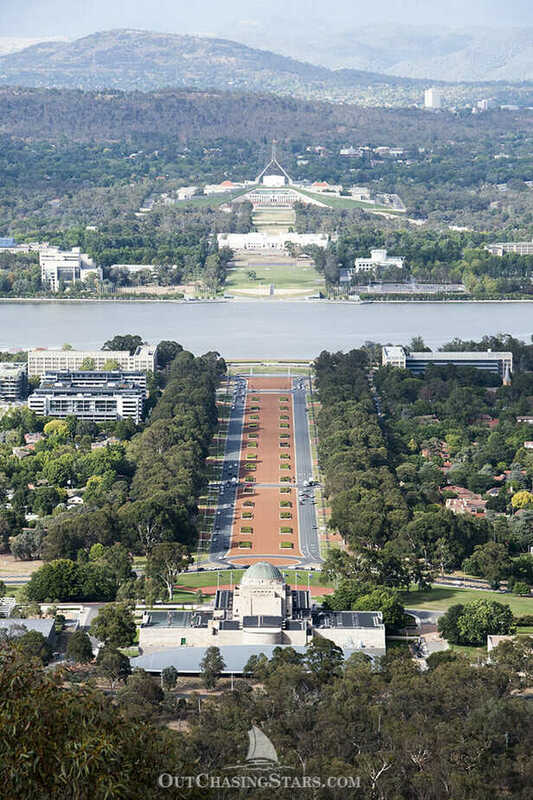 I bet a lot of tourists can not name Australia’s Capitol. Wow. You just made me realize that I know close to nothing about Australian history. I hadn’t even heard of Canberra. That’s so cool that you got to hang out with the Senator and get a private tour of the premises. Do you know what happened to the aboriginals that were initially displaced in order for Canberra to be built? I don’t know but that is a good question. We spent some time last year in New Zealand, and it’s an interesting contrast between the two in regards to how the native population was treated. Maori people, while it was not positive, seemed to have been better off than either Native Americans or Aboriginals. I love the specificity of 54 hours in Canberra in your title. It looks like a great place to visit. Your personal tour with Senator Marshall was clearly a highlight. And, how cool is it that you scheduled a meet up? Omg Romeo that eats figs out of a hand is the cutest! I’ve actually never read about how Canberra was found, so it was interesting reading this. 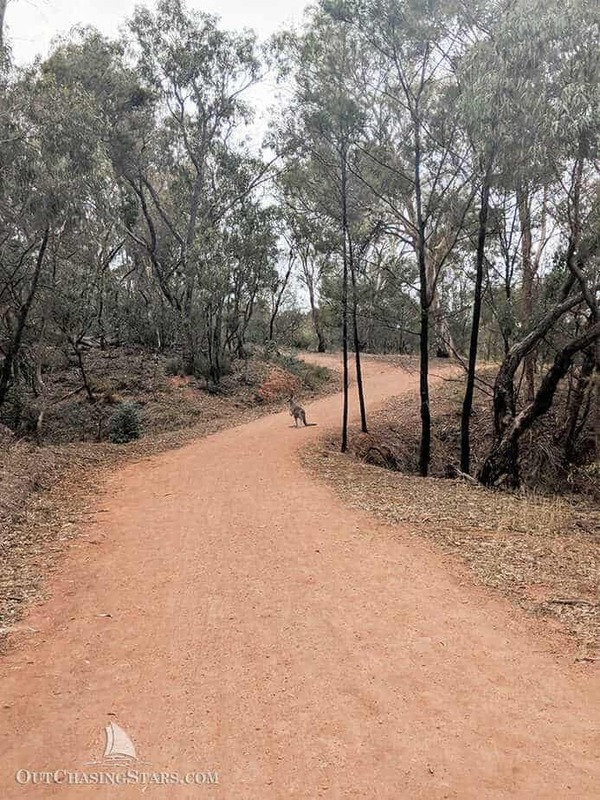 It’s always funny to see all this kangaroos roaming around on Australia pics- such an unusual sight! Interesting to hear about the story behind choosing Canberra as the capital! That Afghan food looks delicious, especially the mantu! Right? It’s a unique story. What a whirlwind adventure! You got to see and do so much in such a short time! And to get invited by a Senator because he liked your videos that’s very cool. And even better to see old friends and new ones in a foreign land. Haha, yes we did! It was a great trip. Right??? It’s so quirky and adorable. Kangaroos are everywhere! 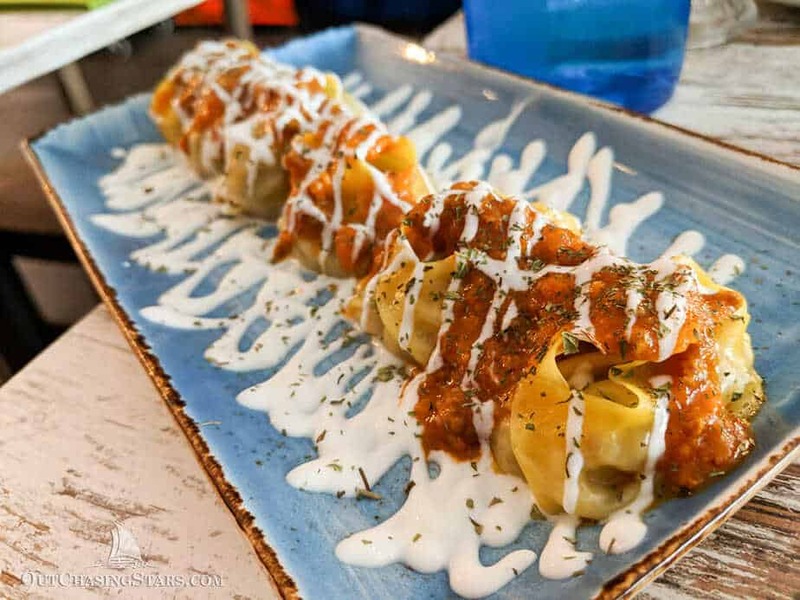 You should check out the experience we had in Coffs Harbour…roos on the beach! 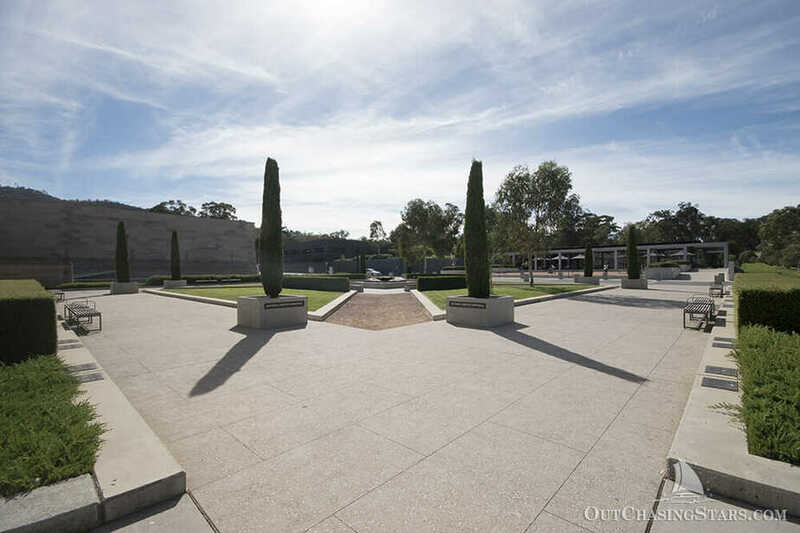 I livd in Australia for a year and never visited Canberra. I’m kinda bummed about it. You’ve got great info here! 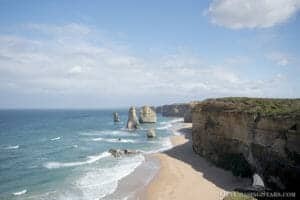 Hopefully I can use some of your tips for my next visit to Australia! Thanks! I hope you make it back someday. Great post, it looks like you had a wonderful time. 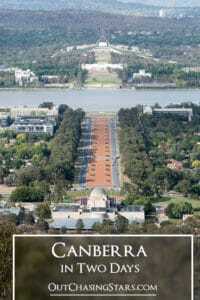 Australia is on our bucket list and never thought of Canberra as a place to visit until now. Thanks! Australia is such a great destination. So much to see and do. It was really interesting to get insight into Australias politics. Not as divided as the states, but interesting nonetheless. Wow! Sounds like a really exciting visit, some great tips! Such an awesome post! I’ve always wanted to visit Australia and this just made me want to even more! I’m glad! It’s a great place. Wonderful post – filled with interesting facts and anecdotes. So glad you had a great stay in Canberra. How cool that you personally got invited by Senator Marshall for a tour of the Parliament. It looks like you had a very eventful and stay. I’ve never heard of Canberra but now I’m intrigued. Pretty wild that it’s the countries capitol but most people have never heard of it! I didn’t know anything about Canberra before I read this post. It looks like you had a wonderful experience though. The buildings are just beautiful and the food looks amazing! You packed a lot into 54 hours. Of course my fab is the guinea pig!